A spectacular single owner sale of a collection formed from the late 1940’s to the 1970’s by Dr Bryan G. Alton and his wife Winnie comes up at James Adam in Dublin on September 6. One of Ireland’s best known and respected physicians Bryan Alton amassed a quality and eclectic collection of fine furniture, porcelain, silver, objets d’art, old master and modern paintings and graphics, icons and exotic items. A highly regarded professional he served as President of the Royal College of Physicians of Ireland, as Master Warden of the Corporation of Goldsmiths of Dublin and on the Board of the National Gallery of Ireland. Dr. Alton died in 1991. 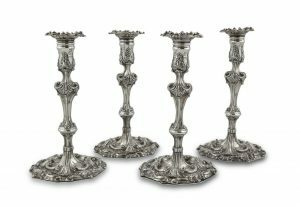 Highlights of this sale of 319 lots include a superb set of four Irish Georgian silver candlesticks made in Dublin by Michael Cormick and William Townsend circa 1760 estimated at €12,000-14,000. 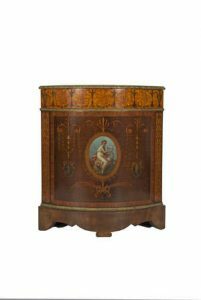 There is a spectacular George III inlaid and painted sycamore bowfront side cabinet, fashioned in the manner of London cabinet-makers Mayhew and Ince (15,000-20,000) and the sale includes Old Master paintings and some remarkable pieces of 18th century Meissen. Here is a selection: UPDATE: THE INDISCREET HARLEQUIN MADE A HAMMER PRICE OF 38,000. 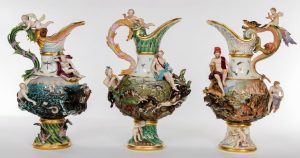 A Wedgwood vase made a world record price of £482,500 at Christie’s in London yesterday. The Wedgwood black First Day vase more than doubled its high estimate to make a world record for a piece of English pottery. 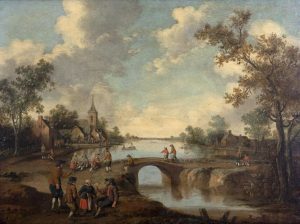 It was part of Christie’s Exceptional sale which made £5,681,250 and achieved a sell through rate of 89% by value and 80% by lot. 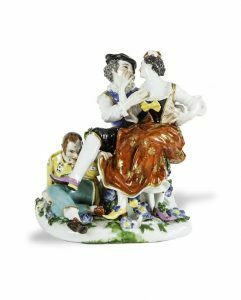 A Meissen white model of a great Bustard, attributed to Johann Goetlieb Kirchner, 1732 made £842, 500, a pair of Sevres bleu celeste ice pails, covers and liners made £842,500 and a pair of Japanese inlaid iron vases and covers from the Komai Workshop, Kyoto made £302,500, a world record for the studio. 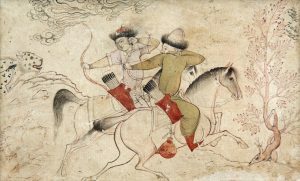 Robert Copley, Deputy Chairman of Group, International Head of Furniture, Deputy Chairman, Christie’s UK said: “The Exceptional Sale saw international participation from registered bidders in 15 countries across 3 continents. 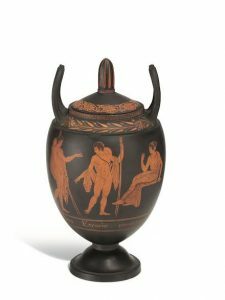 The highlight of the sale was a Wedgwood black ‘First Day’s Vase’, one of only four day vases to have been thrown by Wedgwood himself, and one which has passed through generations of the Wedgwood family before being auctioned at Christie’s”.